Evidence suggests that the Minoans disappeared so suddenly because of the massive volcanic eruption in the Santorini Islands. Excavations there have uncovered Akrotiri, a Minoan town which was buried in this eruption, one of the largest in recorded history. The eruption was only 70 miles from Crete, the center of the Minoan civilization. Recent evidence suggests that the Santorini eruption was up to 10 times more powerful than the eruption of Krakatoa in 1883. It caused massive climatic disruption and the blast was heard over 3000 miles away. We know now that the Santorini eruption and the collapse of the volcanic cone into the sea caused tsunamis which devastated the coasts of Crete and other Minoan coastal towns. Radiocarbon dating shows that a large tsunamis hnit Crete at the same time as the Santorini eruption. Scientists have discovered Minoan building material, pottery and food residue mixed with tiny fossilized sea shells which lived only in deep water deposited up to 7 meters above sea level. This could only have happened by a single devasting sweep of a tsunami. following a pattern similar to the Asian tsunami of 2004. Excavations at Palaikastro on the eastern side of Crete, and show evidence corroborating the tsunami theory - including missing walls which faced the sea where side walls survived. Climate experts have found that climate change as a result of the eruption would have meant cold wet summers for years. The 2004 tsunami resulted in population loss of as much in 80% in places. If the Minoans suffered a similar population loss, it explains why this was a cataclism that they could not recover from. The economic basis of the Minoan civilization was the trade network among the coastal cities supported by its large fleet. Without a fleet and the other cities to trade with, the economic loss must have been great. Writing long after the disappearance of the Minoans, Herodotus, the Greek historian, mentions the much diminished civilization of the Cretans, ravaged by pestilence and famine, a reference consistent with the aftermath of the violent eruption on Thera. See Herodotus on the Cretans. The palaces in Crete were destroyed - none survived but Knossos. This palace was rebuilt and continued to function. The much weakened Minoan Civilization limped along for another 50 years and then disappeared, falling to the mainland Mycenaean civilization. Records kept at Knossos began to be kept in a new script, Linear B, the script found at Mycenaean sites. The population loss, poor harvests and disruption of their trade network seem clear. The social upheaval resulting in such a great mark of the gods' displeasure can only be imagined. Some have speculated that the people no longer had faith in their religious leaders. This shift in power in the Greek world may be confirmed by another Greek legend. The Greeks in later times remembered the story of Theseus, the son of the king of Athens. Athens had to send young people to Crete every year in tribute. These hostages were sacrificed to the Minotaur, a half-bull monster. 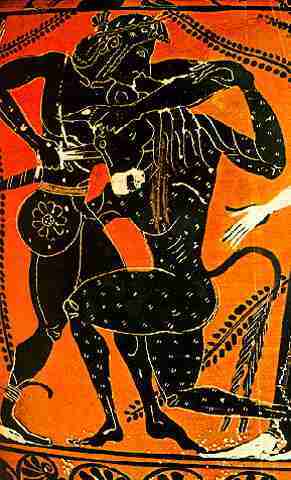 In the legend Theseus found his way out of the Labyrinth, killed the Minotaur and liberated the Athenians. See Plutarch's Life of Theseus for the story of a distantly remembered great civilization on Crete. In the story of the Labyrinth we may have an imperfect memory of an elaborate structure at Knossos with its complex passages and rooms. This powerful Crete of the legend reflects the reality of a great Minoan naval power. It is apparent from the archeological evidence that there is a shift in power. The story of Theseus reflects a distant memory of this revolt and the Mycenaean invasion that ended Minoan power.